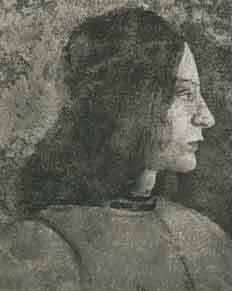 Giovanni Pico della Mirandola (1463-1494) was a brilliant young nobleman from Mirandola near Ferrara. He attended the University of Ferrara and then went to Florence where he entered the circle of the Medici and lived in the Palazzo Medici for some years. While there he was a friend of two future Medici popes, Giovanni de’ Medici (Leo X) and Giulio de’ Medici (Clement VII) and the young Michelangelo. Among his many writings his most admired is his Oration on the Dignity of Man which is often called the “Manifesto of the Renaissance” with its celebration of the beauty and dignity of the human being (think of Michelangelo’s David). The Oration seems a total reversal of the Medieval vision in which the human being and the human world is irrevocably damaged by sin. Here below you will find the first seven sections of the much longer "Oration" that runs to about 30 pages in many English translations. If you wish to read the whole "Oration" you can find it in an excellent translation in The Renaissance Philosophy of Man edited by Ernst Cassirer (University of Chicago Press, 1948). This passage presented here below was originally printed in a reader for a World Civilization course at Washington State University and I am grateful to Paul Brians for its availability. I once read that Abdala the Muslim, when asked what was most worthy of awe and wonder in this theater of the world, answered, "There is nothing to see more wonderful than man!" Hermes Trismegistus (1) concurs with this opinion: "A great miracle, Asclepius, is man!" However, when I began to consider the reasons for these opinions, all these reasons given for the magnificence of human nature failed to convince me: that man is the intermediary between creatures, close to the gods, master of all the lower creatures, with the sharpness of his senses, the acuity of his reason, and the brilliance of his intelligence the interpreter of nature, the nodal point between eternity and time, and, as the Persians say, the intimate bond or marriage song of the world, just a little lower than angels as David tells us. (2) I concede these are magnificent reasons, but they do not seem to go to the heart of the matter, that is, those reasons which truly claim admiration. For, if these are all the reasons we can come up with, why should we not admire angels more than we do ourselves? After thinking a long time, I have figured out why man is the most fortunate of all creatures and as a result worthy of the highest admiration and earning his rank on the chain of being, a rank to be envied not merely by the beasts but by the stars themselves and by the spiritual natures beyond and above this world. This miracle goes past faith and wonder. And why not? It is for this reason that man is rightfully named a magnificent miracle and a wondrous creation. What is this rank on the chain of being? God the Father, Supreme Architect of the Universe, built this home, this universe we see all around us, a venerable temple of his godhead, through the sublime laws of his ineffable Mind. The expanse above the heavens he decorated with Intelligences, the spheres of heaven with living, eternal souls. The scabrous and dirty lower worlds he filled with animals of every kind. However, when the work was finished, the Great Artisan desired that there be some creature to think on the plan of his great work, and love its infinite beauty, and stand in awe at its immenseness. Therefore, when all was finished, as Moses and Timaeus tell us, He began to think about the creation of man. But he had no Archetype from which to fashion some new child, nor could he find in his vast treasure-houses anything which He might give to His new son, nor did the universe contain a single place from which the whole of creation might be surveyed. All was perfected, all created things stood in their proper place, the highest things in the highest places, the midmost things in the midmost places, and the lowest things in the lowest places. But God the Father would not fail, exhausted and defeated, in this last creative act. God's wisdom would not falter for lack of counsel in this need. God's love would not permit that he whose duty it was to praise God's creation should be forced to condemn himself as a creation of God. Finally, the Great Artisan mandated that this creature who would receive nothing proper to himself shall have joint possession of whatever nature had been given to any other creature. He made man a creature of indeterminate and indifferent nature, and, placing him in the middle of the world, said to him "Adam, we give you no fixed place to live, no form that is peculiar to you, nor any function that is yours alone. According to your desires and judgment, you will have and possess whatever place to live, whatever form, and whatever functions you yourself choose. All other things have a limited and fixed nature prescribed and bounded by our laws. You, with no limit or no bound, may choose for yourself the limits and bounds of your nature. We have placed you at the world's center so that you may survey everything else in the world. We have made you neither of heavenly nor of earthly stuff, neither mortal nor immortal, so that with free choice and dignity, you may fashion yourself into whatever form you choose. To you is granted the power of degrading yourself into the lower forms of life, the beasts, and to you is granted the power, contained in your intellect and judgment, to be reborn into the higher forms, the divine." Imagine! The great generosity of God! The happiness of man! To man it is allowed to be whatever he chooses to be! As soon as an animal is born, it brings out of its mother's womb all that it will ever possess. Spiritual beings from the beginning become what they are to be for all eternity. Man, when he entered life, the Father gave the seeds of every kind and every way of life possible. Whatever seeds each man sows and cultivates will grow and bear him their proper fruit. If these seeds are vegetative, he will be like a plant. If these seeds are sensitive, he will be like an animal. If these seeds are intellectual, he will be an angel and the son of God. And if, satisfied with no created thing, he removes himself to the center of his own unity, his spiritual soul, united with God, alone in the darkness of God, who is above all things, he will surpass every created thing. Who could not help but admire this great shape-shifter? In fact, how could one admire anything else? For the mystic philosophy of the Hebrews transforms Enoch into an angel called "Mal'akh Adonay Shebaoth," and sometimes transforms other humans into different sorts of divine beings. The Pythagoreans abuse villainous men by having them reborn as animals and, according to Empedocles, even plants. Muhammed also said frequently, "Those who deviate from the heavenly law become animals." Bark does not make a plant a plant, rather its senseless and mindless nature does. The hide does not make an animal an animal, but rather its irrational but sensitive soul. The spherical form does not make the heavens the heavens, rather their unchanging order. It is not a lack of body that makes an angel an angel, rather it is his spiritual intelligence. If you see a person totally subject to his appetites, crawling miserably on the ground, you are looking at a plant, not a man. If you see a person blinded by empty illusions and images, and made soft by their tender beguilements, completely subject to his senses, you are looking at an animal, not a man. If you see a philosopher judging things through his reason, admire and follow him: he is from heaven, not the earth. If you see a person living in deep contemplation, unaware of his body and dwelling in the inmost reaches of his mind, he is neither from heaven nor earth, he is divinity clothed in flesh. Who would not admire man, who is called by Moses (3) and the Gospels "all flesh" and "every creature," because he fashions and transforms himself into any fleshly form and assumes the character of any creature whatsoever? For this reason, Euanthes the Persian in his description of Chaldaean theology, writes that man has no inborn, proper form, but that many things that humans resemble are outside and foreign to them, from which arises the Chaldaean saying: "Hanorish tharah sharinas": "Man is multitudinous, varied, and ever changing." Why do I emphasize this? Considering that we are born with this condition, that is, that we can become whatever we choose to become, we need to understand that we must take earnest care about this, so that it will never be said to our disadvantage that we were born to a privileged position but failed to realize it and became animals and senseless beasts. Instead, the saying of Asaph the prophet should be said of us, "You are all angels of the Most High." Above all, we should not make that freedom of choice God gave us into something harmful, for it was intended to be to our advantage. Let a holy ambition enter into our souls; let us not be content with mediocrity, but rather strive after the highest and expend all our strength in achieving it. FOOTNOTES: (1) This mystical Egyptian writer, much quoted by Renaissance alchemists, probably lived in the 2nd-3rd century. (2) Psalms 8:5. (3) Moses was reputed to have written the first five books of the Bible. (4) These are the three highest orders of angels in the medieval and Renaissance theory of angelic hierarchy which is, in descending order, Seraphim, Cherubim, Thrones, Dominations, Powers, Angels, Archangels.